The countdown to register for the Light Up To Live Valor Clay Shoot is on. There are only a few teams left. So, if you’d like to join and help our Veteran’s sign up today! 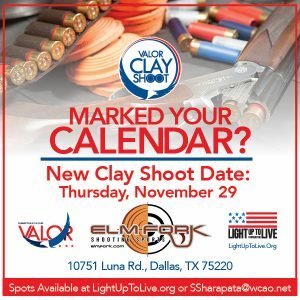 The Light Up To Live Charity Events Valor Clay Shoot will take place on Thursday, November 29, 2018, at the Elm Fork Shooting Sports range located on 10751 Luna Rd. in Dallas, Texas.. The Valor Clay Shoot event features raffle prizes, participation gift bags, and competitions. A few 4-man team slots are still available (while spots last). Space is limited, so don’t delay signing up for this exciting event. The entry fee includes breakfast, lunch and a participation gift bag. You will also receive a cart (as part of a 4-man grouping), 100 clays per shooter, and one golf ball per shooter for the Shotgun Golf. Reservations are accepted on a space-available basis. Entry fees are not refundable. The complimentary breakfast will begin at 8 a.m. At 9 a.m – PULL! The first clay will hit the sky. The awards, complimentary lunch and the Scott Beretta Show take place from noon to 1 p.m. When shooting (or practicing your swing/mounts), position your feet so that a line extending from your rear heel to your leading foot points to where you will break the target. Keep your stance relatively narrow. This position encourages a smooth swing and a good follow through. When pointing your gun, focus on the target and not the gun barrel or bead. Point, don’t aim. Aiming slows your swing and causes you to shoot behind. Since a shot string is 10-14′ long, use it to your advantage by pointing slightly more in front of a target. If you miss crossing targets, you are probably shooting behind. Try to “miss” in front by doubling your lead, and if still missing, try doubling the lead again. When shooting simultaneous (true) pairs, decide ahead of time which target you will break. Generally, shoot the behind or lower target first, unless one target is quick to disappear behind cover or is decidedly more difficult. Shooting the lower target first allows gun recoil to bring you automatically to the upper target. Shooting the back target first allows your swing to continue smoothly to the front target. When you’re experiencing a missing streak, change something. Change one of your postures. Double your lead. Or, give yourself less think time by moving your gun hold point and target viewpoint closer to the breakpoint. Pull the trigger the instant the gun is mounted to your face and the target is in focus. Scott Robertson has been a professional shooter with Beretta for over 20 years, has 23 years of experience in shooting clay sports, and he has won eight National Sporting Clay Championships. If you aren’t into breaking every clay you miss or are unable to attend, you can be involved by being a sponsor for the event. You can even support our heroes by choosing to sponsor a Veteran player, a 4-man Veteran team or you can sponsor a 1st responder. Learn more about being a sponsor for the Valor Clay shoot at Light Up to Live Clay Sponsorship opportunities. The Light Up To Live Foundation is a 501 (c) (3) public charity based in Addison, TX and founded by Randall and Sherry Reed. As a military family, they are dedicated to raising awareness about the members of our U.S. Armed Forces and Veterans living with the effects of Post-Traumatic Stress, Traumatic Brain Injury (TBI), tissue injury, pain and depression. The foundation funds polychromatic light therapy systems that have been shown to increase blood flow in the body and reduce associated minor pain for active military and Veterans that we identify could most benefit from its use. Light Up To Live helps connect these military members and their families to other organizations that are in alignment with our mission to provide direct aid and assistance. We want to light a path to better health. To register and learn about the foundation, visit, LightUpToLive.org. Start practicing those shooting skills and we hope to see you on Thursday, November 29th at the Elm Fork Shooting Sports range.